We’re filled with pride that this unique festival has thrived since 2003 when we pitched that first tent in the Fremont U-Park lot. Our artists, technicians and musicians, volunteers, business sponsors and donors helped us deliver an affordable annual festival, showcasing the international art of live Comedy/Varieté performance. 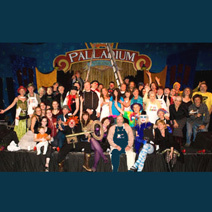 Moisture Festival has featured over 3,000 unique acts on festival stages made possible by 90,000 donated volunteer hours to help produce all shows. That’s no easy feat! “Circus arts possess the ability to heal trauma, build community, improve individual character, and address social challenges.” – Celebrating the Art of Circus, by Michael Orlove, Executive Director, National Endowment for the Arts. Help the festival celebrate the moist season with joy and laughter, generate abundant happiness and ensure this experience for future generations of aficionados. To see a list of our gracious donors, go here. The Festival keeps churning thanks to faithful food & corporate sponsors. Want to get your business involved? Head here. And of course, we are always looking for additional volunteers!